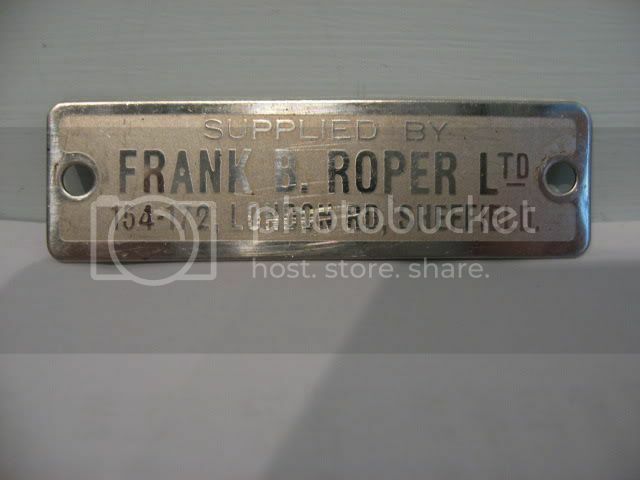 Frank Roper, motorcycle dealer, London Rd. still lookin for a letterhead. my dad remembers them, but doesnt have letterhead, he used to ride a triumph thunderbird. I remember them - you could try the Local Studies Library for adverts in the local papers of the period. They may also have had adverts in the local directories (Kellys')...something you could copy and make a transfer or a badge from. Hello you bsarider you. I remember Ropers and what follows probably wont interest you one bit. The fact is I actually worked there one time, for about a week. At the time I was doing a nights only job so I thought I'd fill my days in working for Ropers. I cleaned bikes and delivered them to various places around Sheffield. In a week I was dying on my feet. I remember there was a couple of Italian guys, mechanics, worked there. Fancied themselves as boxers. There, I told you it wasn't interesting. from. bought lots of stuff from them. Did you by any remote chance still have a bill of sale or a letterhead from them its worth a look. sorry, no. it was 40 years ago. they were agents for reliant spares as well. I remember looking in their window about 1963 at a Bonnie priced about £360 and drooling.As my apprentice pay was £3.1.10d a week ,it remained a dream. I used Ropers in the 1950's Mini moter spares etc, it was advertised as that block of clean and tidy shops, depending on what you wanted there was a number of entrances you got the impresion it was the same man running along the rear of the shops to serve.